The reimagined Dee J. Kelly Center is a showcase — and a home — for TCU alumni and visitors, thanks to the many generous donors and loyal supporters, like you, who made this project possible. Thank you for the role you played in making this a momentous day for TCU. Below is a video of the dedication ceremony and open house, which we hope captures the spirit of the day. Please help us in encouraging other alumni and friends to visit the new Dee J. Kelly Alumni & Visitors Center the next time they are on campus! Chancellor Victor J. Boschini, Jr. announced during the ceremony that the Dee J. Kelly Foundation gave $4 million, the largest commitment in support of the project. 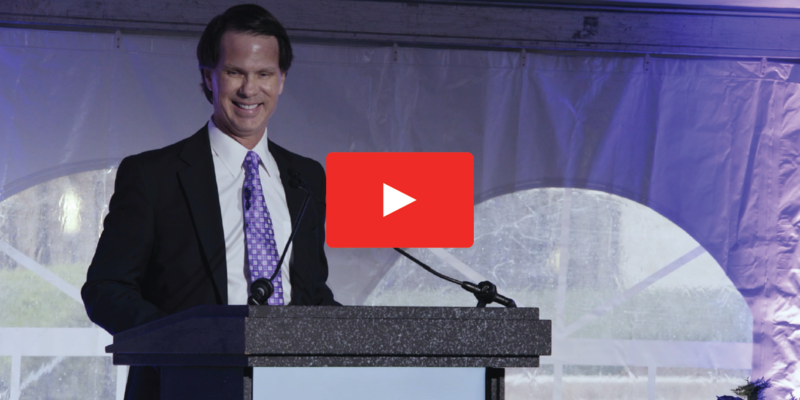 A dedication ceremony and open house were held to honor the late Dee J. Kelly, distinguished TCU alumnus, and to unveil the center, which nearly doubled in size from its forerunner, which opened in 1996. Mr. Kelly, a business and civic leader and longtime TCU Trustee, made the initial lead gift to support expansion of the center before his death in 2015, and the Kelly family, including wife Janice and children Dee J. Kelly, Jr., Cindy Kelly Barnes, and Craig Kelly, made the capstone gift to complete the fundraising campaign for the project. Mr. Kelly saw the need for expansion and updates, and was the first to champion the effort. When the Kelly Center first opened in 1996, the Burnett Foundation and Sid W. Richardson Foundation joined forces to make a naming gift to honor Mr. Kelly. At that time, TCU’s alumni population was about 56,000, and only 80 events and meetings were held at the center annually. TCU’s living alumni now number 90,700 and each year about 2,650 new alumni are added. In the 2016 academic year alone, 1,050 events and meetings were held in the Kelly Center; about 250 more were turned away for lack of space. The $12.5 million expansion and renovation project began in January 2017 and was funded with private gifts. The Fort Worth Business Press reported on the story.